It’s Fabulous Friday (Fabulous for so many reasons – I sure love the end of the week), and today at Tiddly Inks, we are simply sharing some inspirational fun. Okay, I am going to say it – I was at Michaels the other day, and Christmas crafts abound! I have to admit though that I am not quite ready for that yet! However, that didn’t stop me from using this cute stamp called Sugar Plum Fairy. While I did even keep her in a more traditional plum tone, I thought that this was one of those stamps that could be used year round. I mean seriously, would you really only want to colour her one time of the year?! I used Copics to colour “Sugar Plum” to match some Doodlebug paper I had on hand from the Sugar Shoppe collection. I wanted to see if I could create the effect of the two-tones materials that are sometimes used on dance costumes. I decided to keep the main part of her body suit pink, and then add a bit of the mauve on the sides. It’s not perfect (perhaps more of the mauve? ), but I think it works. In any case, with that cute stamp, paper and ribbon from May Arts (you know I love my 3/4″ Twill Chevron), This card makes me smile! Make sure you pop on over to the Tiddly Inks blog to check out the winner from our School Rules challenge, and to see all the other crafty inspiration! Thanks for stopping by! 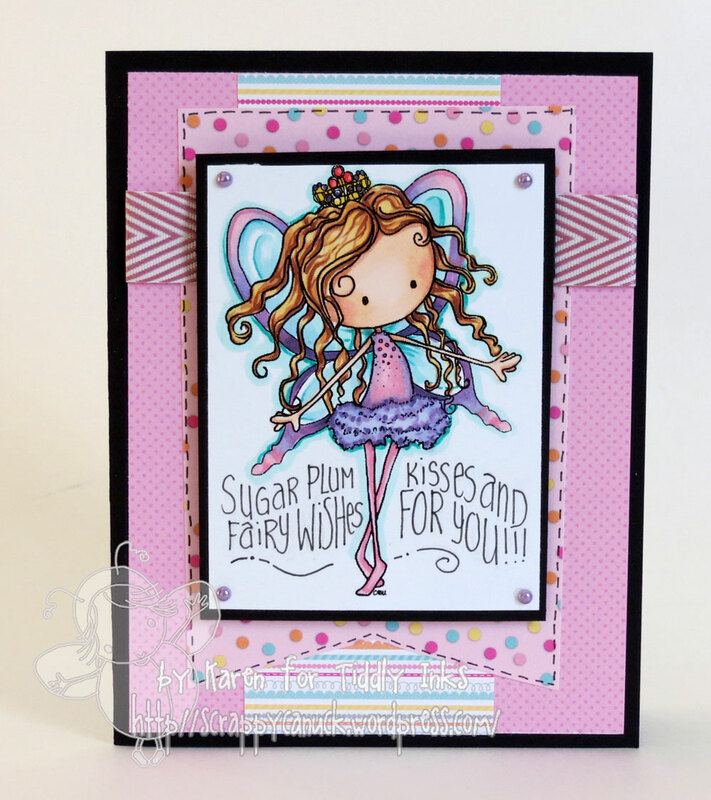 This entry was posted in Cards, Tiddly Inks and tagged Doodlebug, May Arts, pink, sugar plum fairy, sweet shoppe, tiddly inks by Scrappy Canuck. Bookmark the permalink. So cute! The colours are lovely! Beautifully done! Love your colours!